I was in Chili’s today and I ordered their “Triple-Dipper,” a three appetizer combo. While I waited for the food, I noticed another kind of combo. Chili’s is doing a full-featured cause-related marketing campaign for St. Jude Children’s Research Hospital. There was a four-sided laminated table tent outlining the campaign on the table. When the waitress brought the drinks she slapped down Chili’s trademark square paper beverage coasters and on them was a call to action for an element of the campaign called ‘Create-A-Pepper,’ a kind of paper icon campaign. The wait staff was all attired in black shirts co-branded with Chili’s and St. Jude. The Create-A-Pepper paper icon could be found in a stack behind the hostess area. The Peppers are outlines of Chili’s iconic logo meant to be colored. I paid $1 for mine, but they would have taken $5, $10, or more. The crayons, too, were co-branded with the ‘Create-A-Pepper’ and St. Jude’s logos. There’s also creatapepper.com, a microsite, but again with a lot of features. You can browse a list of celebrity-created peppers from the likes of Cindy Crawford, Reese Witherspoon, Jay Leno, Steve Carrell, Kurt Russell, and others. There’s a cool online version of Create-A-Pepper where I made an awful mess. There's a sweepstakes element for the best Create-A-Pepper coloring sheet. A merchandise section sells dog tags and the T-shirt the Chili’s staff was wearing. And, of course, a donate now button. Even though I was wowed I came away with a few questions. I’m not a fan of paper icons shaped like an element from the sponsor’s product line or their logo. It brands the sponsor, sure. But isn’t it better for the sponsor to wrap itself in the charity rather than the other way around? In the Chili’s where I ate, I had to ask the hostess for the icons on my way out. Wouldn’t it have made more sense for her to mention ‘Create-A-Pepper’ as I came in, thereby giving me time to color it while I waited for my meal? If she doesn’t know how to do that she needs a script that tells her how. I wondered about the cost. A note on the Create-A-Pepper says that “100% of the purchase price of this coloring sheet will go to St. Jude Children’s Research Hospital.” That’s reassuring. But who paid for the paper coasters, the staff’s T-shirts, the table tent, the crayons? Is that fair? Probably not. But that’s the way people think. I left Chili’s quite full. The Triple-Dipper is a lot of food. Likewise, the Create-A-Pepper is a lot of campaign. A few tweaks and it could be a great campaign. I'm a chili's employee. We pay for our own shirts, and are happy to do so: 60% of the $12 we pay for each shirt goes to St. Jude's. I assume the rest goes to the cost of the shirt and paying off any middle-men. They're also comfy and fun to draw on, so they're a nice switch from the loathsome polo shirts. 100% of the coloring pepper donations go to St. Jude, but I don't know who covers the cost of the paper and coasters. I'm absolutely certain that the marketing is worth it: I have pulled in over $300 in donations in two weeks by suggesting the peppers to color, and simply mentioning the charity without the added "draw" of the colorful marketing, our t-shirts, and the hundreds of cheery colored peppers stuck to our walls. It's evidence that everyone else is doing it, and it adds an element of fun to giving. I'm equally curious who foots the bill on the coasters and such. We don't have branded crayons, and I know our local chili's store pays the bill for those, but the rest is a mystery. Have fun coloring this month. If you're really sold on the food + donation idea, all of chili's profits nation wide for September 24th will go to St. Jude's, so you might consider stopping in for a bite then! 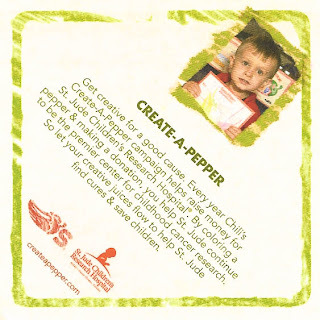 Chili's covers all of the costs for all of the marketing items associated with our create a pepper campaign. Each individual restaurant pays for the coasters, peppers to be colored, tshirts, dog tags, crayons, etc. It is a cost that we are happy to cover so that we can raise as much money as possible for such a worthwhile cause!! You said: Worse, there’s a kind of Catch-22 in effect. Even if Chili’s covered all those costs, there are still a substantial (if minority) audience of critics who would say, “why didn’t Chili’s just give St. Jude all the money rather than buy a bunch of fancy T-shirts and crayons? It is our job to help support this fight. Too many people look at "corporate america" and expect them ti fix it all. The dog tags, shirts and color sheets.... maybe if the world gave freely companies would not have to find something to "give" you for a donation. I can't even believe you are complaining about it.... someone giver her the $1 back!!!!! Obviously, the paper & crayon items were given by printing/suppliers who pay PENNIES for these items & give them as a donation...and as previously mentioned, the employees, themselves, give their own money for the shirts (and we all know they are on a limited income), so if THEY are so willing to give, so should everyone else. Looks like you put quite a bit of time & energy into picking apart an absolutely awesome cause. Rather than giving a dollar & wondering where it all goes, why not give DIRECTLY to St. Jude & then you'll know for sure! Also obvious that you have not had a loved one at St. Jude....do you know it costs over $1,000,000/day to keep running? Prob not, so let's take ALL the St. Jude charities we can get (big or small;and this is a big one!). I have to admit im floored that someone even took the time to think this deeply into this, how about dont you have the heart to not question and judge and just donate? I myself am a Chili's emplyeee and they could have the shirt off my back. I run the campaign in my store adn ya know what I DONT CARE WHO GETS WHAT, you would be amazed at what people will do for free when you mention St judes, so i am assuming there are many companies who have donated their services to support the cause. If you truly thought this much on this campaign then you are not that interested, for i also have a family memeber who is dying from cancer and i have seen how it racages a soul, CAN U LIVE WITH YOURSELF KNOWING IT WAS MORE IMPORTANT TO THINK ABOUT THE NUMBERS OF THE GAME THEN TO THINK HOW ALONE AND FRIGHTENED THESE KIDS MUST FEEL AND FOR ONCE BE PROUD OF WHAT YOUR DOING AND GIVE OUT OF THE KINDNESS OF YOUR HEART? I am ashamed to know there are people who think this way, life is hard enough with this situation and god forbid you ever need St Judes are they going to ask you where did your paper some from, and Seems you have nice clothing so maybe you can afford something, NO THEY WILL NEVER ASK. THEY HELP AND GIVE AND YOU SHOLD BE QUITE GRATEFUL AND DONT YOU JUDGE UNTIL YOUVE STOOD IN THOSE SHOES. I just want to say that having a son who is a patient at St. Jude, I don't care where everything comes from. Thank you to each and every one of you who work at Chili's, bought the products, colored a pepper or just donated money. I'm sure marketing has it worked. As a business owner I know sometimes you have to spend money to make money. Yes, Chili's could have donated the money they spent, but would it have been as much money as they brought in by the promotion? I do know St. Jude covers everything for us. Without them, I can't imagine where we'd be right now, so once again I say thank you to everyone who has helped or plans to in the future! I am currently a Chili's employee in MT. We just started the St. Jude Creat-a-Pepper campaign a couple days ago. Today while I was at work, I was explaining the whole thing to a couple. The woman looked at me and said, "I just have one question. How much of this money does St. Jude's actually see?" I told her and showed her where it is written that St. Jude's will get 100% of the donation. She still didn't donate. It made me feel like people are looking at either me (personally) or Chili's as if we are taking their money and not giving it to St. Jude's!!! I don't know why, but I felt personally hurt by it...I could never imagine taking people's well-intended money and keeping it for myself! Some people are just so negative that they can take something so honest, kind, and pure...and turn it into something deceitful! I am proud to help raise as much money as I can for St. Jude's Hospital!!!! As a parent of a St. Jude patient- Chili's built an enitre building up there and opened it nearly a year ago. they have commited Millions of dollars to St. Jude- so I dont think the cost of a coaster is a big deal. Also- think about that family whose child is on the coaster. St. Jude is the best place in the world and Chili's has 100% of my respect. Last year they surpassed their goal on fundraising and gave the extra to St. Jude- whereas other places only commit a certain amount. Also - St. Jude has one of the highest percentages of actually giving the money to the kids. I am thrilled for you that you dont have a one year old battling cancer and can have time to question things like this. purchased for donation the St. Jude house keys. We are all so proud to be using them.These keys remind us all how much these precious little children who suffer from cancer need our help. As far as person who is worried who pays for all this Stuff, did you know that Chili's pays the cost for the shirts, keys, create a pepper pictures, etc.... Stop and think about why Chili's does this fundraiser.Sure Chili's naation wide could "just write a chek" and send it to St. Jude but this fundraiser gives caring adults and children a chance to be a part of something so important. You should see the look on the kids faces, not to mention adults as well when they color in the peppers. Obviously you have never lost anyone close to you from cancer? Well let me tell you it is the worst thing to watch someone you love so much wither away and die. Did you slao know that Chili's has built a Chili's Care Center in TN for these children? Look it up and do some research on it. Chili's nation wide raised over 6 Million dollars from caring people in just one month. With the state we are in with this economy, I think this is totally awesome. Look nup St. Jude and see what it is all about. Maybe you'll change your toon. A quick Google search for St. Jude reveals that nearly 85% of the funds donated to St Jude go directly to patient care. St Jude is one of the largest non-profit organizations in the WORLD and their CEO makes less than half a million dollars a year. Their administrative costs are less than 10% of their yearly operating budget. The hospitals daily operating budget is nearly $1.5 million/day. Have you ever heard the expression "you have to spend money to make money"? I have to give them props for being soo efficient with the money they receive - they operate 100% on donations. Chili's donated the "Chili's Care Center" to St. Jude, a state-of-the-art, like-no-other in the world facility that revolutionizes cancer research, treatment, and patient care. Chili's made a 10 year, $50 million promise to St. Jude... they're ahead of schedule on the funds... and they raise all the money through their Create-a-Pepper campaign that only runs for one month a year. I think they can spend a few hundred thousand on some stupid coasters and t-shirts. And to answer your question... the cost is built into the price of your meal, just like all of the restaurant's other advertising expenses. I am currently a server at Chilis and I have been there for 2 and a half years. I have helped raise quite a bit of money for St. Judes selling keychains, shirts, chili silly bandz, and create-a-peppers. I don't personally know anyone that has ever been a patient at St. Judes and really didn't know much about the hospital until I started working for Chilis. Chilis is a HUGE sponsor for St. Judes and I am not sure how the hospital could operate without the donations that we are given. A lot of my guests are ecstatic to give, some give hesitantly, but I just cannot understand and am disguisted at guests who actually go OUT of their way to make rude comments or demean and degrade the fundraising. How can people be so hateful and untrustful? What is a dollar, really? Not a lot to you, but put with several becomes something! What is giving one measly dollar going to hurt? I just look at you and think 'wow this person must be broke. And if they are that broke they should have gone to McDonalds for a double cheeseburger'. Even I bought my own shirts, silly bandz, keychain...etc. Those people sometimes tip me a decent tip, and if they do I usually take a dollar or two out and donate it myself. Oh, and while you're reading...thank God this is anonymous...but $3 tips may get you chased out into the parking lot, $5 is acceptable $10-$15 is good,and more than that, we freakin love you! lol!!!! !